Just call it the 'Google I' conference, because it's just On! Update: Google IO 2014 is over and done with, but we've laid out the highlights to the two-hour Android conference. The Google IO conference has On/Off in its name, but it was "on" when the Android-maker dissed Apple at the same time it revealed an updated version of its mobile operating system. Yes, this year's convention was more subdued. There were no Google Glass skydiving stunts and some products like the Moto 360 watch are still veiled in darkness. That won't matter to Android's core audience. While some companies struggle to expand into new product categories, Google is moving watches, televisions, gaming set-top boxes and even cars. Android L is the newest version of Google's iOS 8 rival and while it come with the flavorless L name, it'll nonetheless be eaten up by the Android community. This version features performance and design optimizations of its billion-strong mobile operating system. First up, notifications are being incorporated into the lockscreen. No more having to unlock, swipe down and read. It's all just right there. That same phone and tablet lockscreen will automatically unlock whenever you're near it while wearing a Bluetooth-connected device. If it can't detect you anymore, the screen will auto-lock as a safety precaution. Beyond the lockscreen, Android L will look better than previous update with Google's Material Design. It "pops" with a UI that's consistent between Android, Chrome OS and Android Wear. Google's smartwatch platform made its on-stage debut at Google IO with the company calling it a "new phase in miniaturization of technology." The LG Watch and newly announced Samsung Gear Live are now available to order in the US. Those lucky enough to be at Google IO will receive either watch and, eventually, the Moto 360. For everyone else, the Moto 360 release date is stalled with a vague summer launch and still unspecified price. The Google Glass-fileld audience didn't much care for this. Only now is it possible to make a powerful computer comfortable on the body all day long, according to Google. It'll make your in-real-life conversations more comfortable too. That's because Android users typically check their phone 125 times a day, according to Google. Instead of getting out that increasingly large phablet like the Galaxy Note 3, an Android Wear smartwatch on the wrist will quickly show you relevant information at a glance. Android Wear supports both circular and square-shaped displays and follow Google's design trend of appearing as a stream of cards. Swiping and pressing and holding changes cards and options. Apps for reminders, navigation via Google Maps mobile were demoed and a full Android Wear SDK is available to developers. Consumers should start seeing watch apps as soon as the watches launch. Even though driving and fumbling with a smartphone is unsafe and in many cases illegal, people still do it. That's why Google is introducing a rival to Apple's CarPlay. Android Auto casts Google's smartphone experience to your car's screen and supports steering wheel buttons, console dials and touchscreen. All of the apps are still running on the phone. That means the experience gets better when updating the Android-native apps or whenever you get a new phone. You won't have to upgrade to a new car to enhance the experience. It also means that Google Maps can finally be in your in-car infotainment systems. Everyone's favorite navigation platform is joined by familiar Google's contacts, messages, reminders and music services. How it stacks up to Apple CarPlay remains to be seen, but we want to take it for a test drive. We already knew Google intended to rebranded its Google TV platform to Android TV, but today was the first time we saw it demoed on stage with new features. The smoother scrolling experience of the user interface is coupled with new voice search capabilities. It goes beyond searching for movie titles and TV shows like the Amazon Fire TV. Google voice searching for actresses brings up bios to help you answer that "What else do I know her from" question. The same thing happen when asking for "Oscar nominated movies" from a specific year - you'll realize you don't agree with any of the Academy Award voters. Android TV is also getting native game support, though you should expect tablet calibur games at first on the line of NBA Game. The new TV platform is coming this fall and has television manufacturers including Sony, Sharp and Philips are already on board. Chromecast wasn't left out in the wake of Android TV's Google IO debut. The inexpensive app-streaming dongle is officially getting Chromecast mirroring of Android devices. This matches the current Chrome browser mirroring as well as the iOS Apple TV mirroring option that's long been available. To prove that anything on your smartphone or tablet can be put up on the big screen, Chromecast was used to mirror the Android camera app, something that typically you wouldn't want to mirror. Google IO didn't have very many surprise announcements. That means we were, of course, overreaching when it came to some of our hopeful predictions. Clearly, Google wasn't ready to unveil its army of robots led by Android creator Andy Rubin and the newly acquired Boston Dynamics. Also oddly absent was Google Glass. The company dove into wearables, but its face-worn gadget didn't get much of the spotlight outside of crowd pans of people wearing Google Glass. Many of the surprises actually came in pre-Google IO announcements. Google Glass was upgraded to 2GB of RAM, double the memory specs from before. Nest also bought Dropcam last week, so we didn't see much of the smart home here today. That being said, Google did unveil a new Android Wear smartwatch, the Samsung Gear Live. It and the LG G Watch will be available today. The Moto 360, as expected, is coming out at a later date. New tablets, meanwhile, may come next month. That's what happened last year when the Nexus 7 and Chromecast launched one month after Google IO 2013. 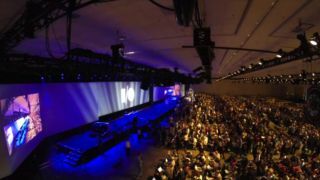 It was a more developer-focused Google IO, but the conference did successfully show how the company is trying to tie all of its endeavours together, ending a bit of its much-hated fragmentation.